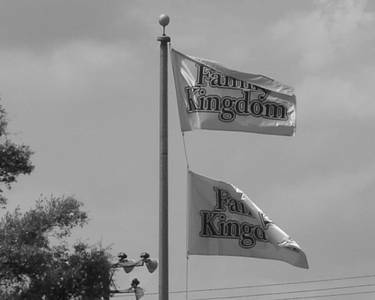 ...we arrive at Family Kingdom. Here is a list of all the rides and attractions. Look who got a new camera. Now if they can learn how to use it. And take off the stickers. So since we are ACE members, Family Kingdom offers an all day ride bracelet for like $12. That is half price. Totally worth it since it cost like $5.25 to ride Swamp Fox once. hurricane Hugo hit it back in 1989. This coaster was built in 1966. Ok I gots my ride bracelet...let's get our ride on. The park has made alot of improvements since I was last here. "Look gurl, they gots roses!" ..A fanny pack or a belt....you decide. I was happy to see this also...new tracking! I heard this screaming and thought it was someone falling off a ride, but it turned out to be Rodney! He is working these kiddy cars like whut!? Bye Rodney, while you take a poop break, we are going to ride Swamp Fox. ..I think this sign needs to be updated a little. Jarsh and James LOVES it in the rear. Shocking. I see the train a comin'! Ford and I rode in the front. The weather is awesome today BTW. Across the street is Family Kingdom's water park, right on the beach. air coming back into the station! "I'm still working while you guys are having fun." Click here for page 2 of Family Kingdom!